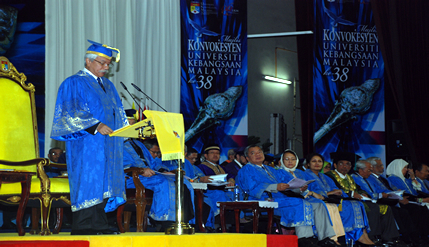 BANGI, 7 August 2010 – Some 64 international students, almost half from Indonesia and Jordan, graduated with Ph.Ds at the 38th Convocation of Universiti Kebangsaan Malaysia today. Students from Indonesia and West Asia form the bulk of the 2,583 international students from 56 countries studying at the post-graduate level in Universiti Kebangsaan Malaysia. This year, UKM produces 233 Ph.Ds, including the 64 international students, setting a new record and the biggest compared to other local universities. Of the 64 international students, 21 are from Indonesia, 10 from Jordan, seven each from Yemen, and Iran, five each from Bangladesh and Libya and two from Sudan. The others are one each from China, Oman, Iraq, Nigeria, Palestine, India and Turkey. Of the 21 Indonesian scholars, seven of them obtained their Ph.Ds from the Science and Technology Faculty, five from the Islamic Studies Faculty, four from the Economics and Business Faculty, three from the Social Sciences and Humanities Faculty, one from the Institute of the Malay World and Civilization (ATMA) and one from the Education Faculty. Of the 10 Jordanians, four obtained their Ph.Ds from the Islamic Studies Faculty, four from the Science and Technology Faculty, one from the Education Faculty and one from the Medical Faculty. Two of the seven Iranian scholars received their Ph.Ds from the Science and Technology Faculty, two from the Education Faculty, two from the School of Graduate Studies and one from Engineering. Three of the Yemeni scholars got their doctorates from the Science and Technology Faculty, one from the School of Graduate Studies, one each from the Faculty of Medicine, the Social Science and Humanities Faculty and the Engineering Faculty. Of the five Libyan scholars, two had their Ph.Ds from the School of Graduate Studies, one from the Science and Technology Faculty, one from the Economics and Business Faculty and one from the Faculty of Islamic Studies. The lone scholar from China earned his Ph.D from the Institute of Malay World and Civilization, the Palestinian from the Islamic Studies Faculty, the Iraqi from the Science and Technology Faculty, the Nigerian from the Education Faculty, the Omani and Indian from the Faculty of Allied Health Sciences. The scholar from Turkey was awarded his Ph.D by the Economics and Business Faculty.